BlackOut Design was recently engaged by Paul Nardone, proprietor of Outrageous and Secretary of the Board for Equality Pennsylvania, to design the Annual Review for Equality Pennsylvania. 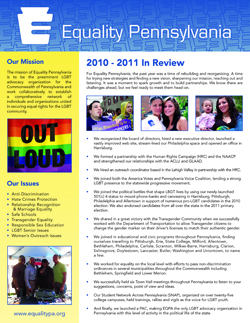 Equality PA was in search of a communication piece to reflect the accomplishments and milestones of the organization as it has impacted the Commonwealth of Pennsylvania throughout the past year. We love a new challenge as well as the opportunity to learn about local organizations. The mission of Equality Pennsylvania is to be the preeminent LGBT advocacy organization for the Commonwealth of Pennsylvania and work collaboratively to establish a comprehensive network of individuals and organizations united in securing equal rights for the LGBT community. Our team was eager to assist with such a significant project. Paul suggested BlackOut Design for this task because of our commitment to our clients and our talent to deliver bold new designs. With the guidance of Paul and the rest of the Equality PA Board, BlackOut was able to properly showcase the accomplishments, initiatives, programs, issues and more in order to create further awareness of the past, present and future of Equality Pennsylvania.